A 45-year-old bottling of Ben Nevis is the first of a Scottish folklore-themed series of single malts launched by whisky company Cask 88. 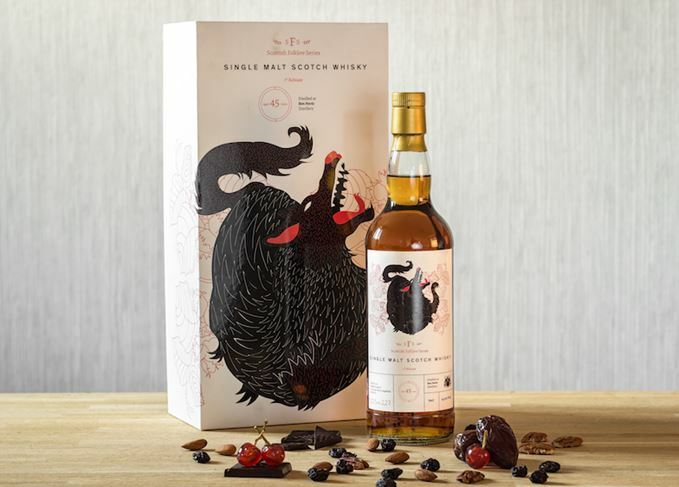 The 1972 whisky is named Cù-Sìth after a ‘terrifying’ large hound, reputed to possess a murderous bark and to stalk the Highlands, preying upon weary travellers. Anyone who hears the beast bark three times, it is said, will be instantly transported to the underworld. Bottled at 43.2% abv, drawn from a Sherry hogshead and priced at £650 per 70cl bottle, 228 bottles of Cù Sìth Ben Nevis 45-year-old are available now from Cask 88’s online bottle shop. The Scottish Folklore series will comprise six single cask whiskies, each featuring a different mythical beast. ‘We intend to create a fantastic collection of some of the finest Scottish whiskies, selected to represent the breadth and depth of Scotland’s world-renowned culture and heritage, while playing our part in ensuring these enchanting myths and folk tales endure for generations to come,’ said Cask 88 European sales director Jonny Fowle. Cask 88 worked with art historian and Celtic expert Dr Frances Fowle to understand the history of the Cù-Sìth legend and its place in Scottish folklore. As a man, he was a ‘happy Hercules’ – and, as a distiller, a larger-than-life self-promoter. Dave Broom on Consortium of Cards II, indie Glentauchers and new bottler North Star Spirits. From a meaty Ben Nevis to a creamy, vanilla Glenrothes, with a dash of Bruichladdich in between.